Controversies over the mode of primary elections to be adopted by the All Progressives Congress (APC) ahead of next year’s general elections and fee for Expression of Interest and nomination forms have widened the chasm in the ruling party resulting in pockets of secret meetings by aggrieved members. Not comfortable with the rumbling in its fold, the party has threatened to come hard on any of its members conspiring to subvert the decision of the National Working Committee (NWC) to adopt direct mode of primaries into its various elective positions for the 2019 general elections. While the NWC and the National Executive Council (NEC) have adopted the direct primary, which allows for mass participation of members, and also leaving room for indirect, delegate or consensus elections, where logistics for direct primary elections are difficult, a group within the party is set to lock horns with the leadership over the decision. But the party in a statement by acting National Publicity Secretary, Yekini Nabena, yesterday, described a meeting purportedly called by unnamed members, apparently to discuss the twin issue, as illegal, warning that it would not hesitate to sanction any party member who flouted the decision of the NWC. 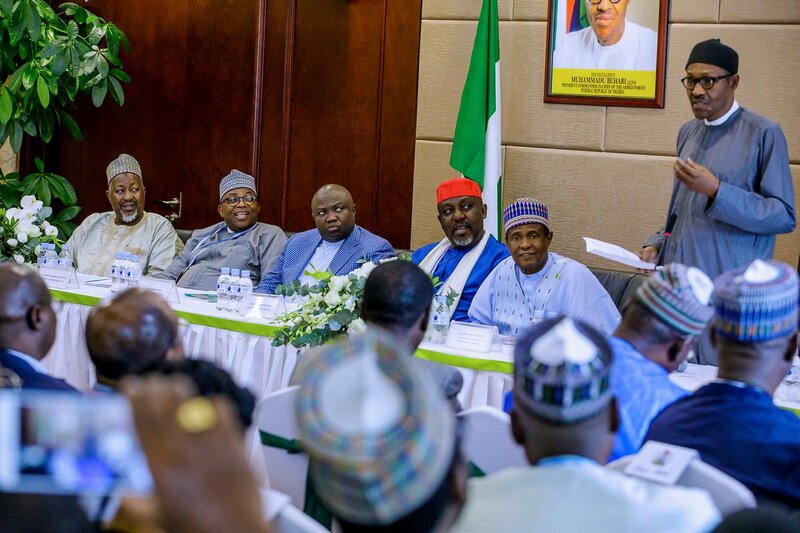 “The attention of the NWC of the APC has been drawn to an illegal meeting scheduled to hold in Abuja by some members of our party organs, with a view to fault the decisions made by the NWC followed by the National Executive Committee (NEC) as regards the mode of the party’s primary elections. “We want to state clearly that the meeting is illegal and an attempt to puncture the sincere efforts being made by the Comrade Adams Oshiomhole-led NWC to reposition our party ahead the 2019 General Elections and to ensure unity, equity and justice in the party. “The outcome of such meeting which is already known will be a nullity and we admonish our members to disregard such meetings in the interest of the party. It is illegal to call such meetings outside the purview of the constituted authority. “The identities of those plotting such meetings have been identified and unless they desist from such they will be dealt with in line with the party’s Constitution at the appropriate time. The NWC will resist any attempt to disrupt the current peace and harmony prevailing in our great party after the exit of some members of our party. “We urge any member who is not satisfied with the decisions of the party to utilise channels provided by the party’s constitution to air their views. We remain focused in delivering good governance to Nigerians and above all ensuring the victory for our party come 2019 and we will not be intimidated by the antics of a few in ensuring success for our party,” Nabena said. The warning was a reaction to an invitation informing APC aspirants for the 2019 elections of a meeting to kick against the cost of nomination forms, which they said is outrageous. There has been a battle of wit between those in favour of direct primary on the one and others who prefer indirect primary. The latter faction is populated by governors. It was in a bid to find a meeting ground that the NEC of the party reportedly prescribed the direct primary for the president while it gave states the free hand to decide their own mode of primary. That much was confirmed by Plateau State Governor, Simon Lalong, in a post-NEC meeting media briefing. However, barely 24 hours after, the party spokesman, Yekeni Nabena, said the decision of the NEC was that all primaries would be conducted through direct method. According to sources, the method which was used in the selection of a candidate for the imminent governorship election in Osun State, is being seen by governors as a grand plot to shift the ground from under their feet. “We are determined to fight it with the last drop of our blood, even if it means tripping over the party,” one of the governors was quoted as saying. Meanwhile, the Senate Deputy Whip, Senator Francis Alimikhena, said the President Muhammadu Buhari would win a second term with breaking a sweat. Alimikhena, who spoke at a sensitisation programme organised by members of Edo North Investment Forum, said his performance is sufficient campaign to guarantee his victory at any poll. He said every attempt must be made to prevent the PDP from returning to power. “The PDP would have auctioned Nigeria if given the opportunity. The high level fraud and abuse that characterised the privatisation exercise under the PDP era would have continued and left this country a barren nation if not for the emergence of President Buhari who terminated their plans of making Nigeria a miserable place,” he said. Theresa May, Nigeria and Africa!